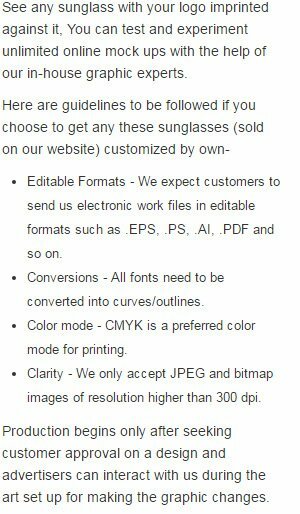 Advertisers who wish to order the fashionable promotional sunglasses on urgent basis can always prefer this 1 day rubberized promotional sunglasses offered in 31 colors. The rubberized frame of this sunglasses makes it different and is favored by many fashionistas who wish to implore something different from the regular. Advertisers can order it in large numbers and seek discounts. Free art set up is offered on orders above $300.